Deliberate practice: In a previous post, we looked at role of deliberate practice (a specific type of practice) in the making of an expert. Say, I am convinced of this method and I start deliberate practice. How do I know I am getting better? In Talent is overrated, author Geoff Colvin tells us to ask this question: Can I see more with less? Reaction time does improve with practice. However, it belongs to the land of mediocristan and follows 80-20 rule. That is, nearly all the improvement comes in the first little bit of training. After that lots more practice yields only a little additional improvement. This means reaction times poses inherent limitation as to how much you can improve. However, researchers found something interesting as to how top players overcome this limitation. By watching eye movement of top players using sophisticated equipment researchers have found that top players weren’t looking at opponent's ball. They were looking at opponent’s hips, shoulders and arms that foretold where they would hit the ball. This gave them additional time to adjust themselves. Experts perceive more with less: Researchers have uncovered the same phenomenon in many kind of sports and in a wide range of other activities. Top performers figure out what’s going to happen sooner than average performers by seeing more with less. For example, jugglers don’t need to see the whole path of the balls. When their vision is restricted they can make necessary adjustments as long as they can see just the apex of each ball’s trajectory. 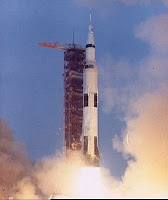 Apollo 13 explosion, a black swan: Let’s re-visit the Apollo 13 story we discussed last year. Ken Cox, Technical Manager of the control systems program proposed that they should build a contingency mode of coming back in case there is an explosion in the main command module. Apollo Program Office (like any other project review committee) asked the question, “What is the probability of this event occurring?” Ken didn’t have the foggiest idea of what the probability was. So the Program Office turned him down saying, “Well, but you haven’t proved yet that this is really needed.” With his deep conviction and rapport with software control board chair, Ken went ahead and implemented his idea anyway. The explosion did occur and it brought the astronauts back safely to earth. Apollo 13 explosion is a classic black swan and the question program committee asked about predicting the probability of such an event is the classic mistake we make in evaluating ideas. Prediction disability: Nassim quotes a famous baseball coach Yogi Berra in The Black Swan, “It is tough to make predictions, especially about the future”. Black swan wisdom says that we can’t predict a black swan especially in Extremistan where a single event in future can dwarf all other events cumulatively occurred so far. However, prediction is deeply institutionalized in our world and we routinely fill probability of events in the risk plan templates. If we apply the traditional risk plan template of a maintenance project to innovation management, it becomes easier to predict the future of the innovation. If Marissa Mayer had applied risk plan template to Paul Buchheit’s idea of AdSense, perhaps Google wouldn’t be where it is today (see the AdSense story). So if prediction of success is not the way to go in evaluating ideas, what do we do? How to evaluate ideas? Here is an approach which does not require either the innovator or review committee to predict the future. Every idea comes with a set of assumptions why it makes sense (about needs, technology, production capability, profitability). While one can’t predict probability of each assumption turning real, one can estimate (a) cost of an experiment that can validate or clarify each assumption and (b) implication of an assumption turning true or false. For example, in case of Apollo 13, Ken was in a position to tell the cost of implementing his idea and the impact of success was saving lives. Similarly, cost of prototyping the AdSense technology was very low (Paul did it overnight) and implication of the acceptance of this idea was a huge upside. We can plot these ideas with costs on the x-axis and impact on the y-axis. 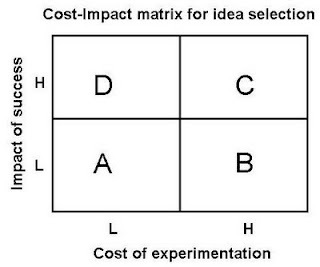 Then we can decide to fund all the ideas in quadrant D and selected ones in quadrant A & C.
What started as a marginal gap between actual operating profit and the one reflected in the books of accounts continued to grow over the years… Every attempt made to fill the gap failed. As the promoters hold a small percentage of equity, the concern was that poor performance would result in a take-over, thereby exposing the gap. 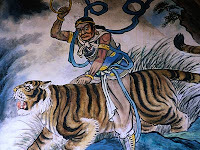 It was like riding tiger, not knowing how to get off without being eaten. Perhaps it starts with what Peter Senge calls a learning disability in Fifth Discipline: Illusion of taking charge in facing difficult problems. As Peter describes, what is typically meant by this is that we feel we should face to the difficult issues, stop waiting for someone else to do something, and solve problems before they grow into crises. All too often, proactiveness is reactiveness in disguise. True proactiveness comes from seeing how we contribute to our own problems. Thanks to reminders from two of my friends RamPrasad Moudgalya and Ravi Aranke I started blogging in December 2007. Posted 9 blogs under Becoming a successful technical leader, 49 blogs under Insights of a catalyst in alignment and innovation (current blog) and 7 blogs under Becoming to being, making a total of 65 blogs during the year. That makes it a little over a 1 blog per week. I thought I will look back and see what I feel about this journey. 1. Me-too syndrome: Why add more noise to already existing one? There is so much being written by so many people. Who has time to read one more blog? 2. Sustainability: Is it something I can sustain for a while, say for a few years? It is my nature to commit to a few things that I enjoy and sustain them over a long time. For example, I have been jogging twice a week for 20 years, cycling regularly for 25 years, practicing music for the past 4 years etc. On the flip side, it has been almost a decade since I stopped watching TV as I felt that I don’t have the DNA to enjoy TV. And there is this third category of things like “learning to speak kannada” where I started serious attempts to learn at least 3 times and did not sustain it long enough to make satisfactory progress. Which category will blogging belong to? What do I think of it after a year? 1. A matter of joy: It has been immense joy to write 300 to 500 words on topics close to heart. It also has a cleansing effect. When I try to structure my thought and write a blog, it clears clutter in my mind. Sometimes it identifies clear gaps in the understanding. Either way it helps me sleep well at night. 2. Importance of communication: Writing a blog is one thing and writing it such that it is sticky is another. Thanks to Made to stick, I realized the importance of various attributes like concreteness, simplicity, story in a communication. Blogging gives me a tool to experiment with various mechanisms to make a communication sticky. 3. Weaving your thoughts: In the last few months, I came to see my blogging as an activity similar to weaving. I seem to be discovering threads in organization innovation and alignment and one by one weaving them to create something more meaningful and useful. For example, one such thread which I discovered during the course of weaving is “Role of insights in innovation”. Another one is “Prototyping”. 4. Marketing tool: These days when I go for meetings with clients or prospective clients, I usually send them links to my blogs on related topics beforehand. 2 out of 5 attendees end up reading some of these. That makes the discussion more meaningful. I have been advocating personal branding through my technical leadership trainings. It feels good to walk the talk. To summarize, I seem to have stumbled upon a new source of joy which is quite unaffected by market swings, global warming etc. Perhaps you might want to give it a shot too.